The first thing I notice about Chloë Grace Moretz is her shirt: It’s the color of a perfectly ripe Red Delicious, and the silky fabric gleams in the natural light of The Greenwich Hotel suite where our interview is taking place. The second thing I notice is how at ease she seems. The way she smiles (openly, warmly), shakes my hand (firmly, but not too firm), and invites me to settle onto the couch with her is more reminiscent of a friend welcoming me into her home rather than a typical, stiff celebrity press interview. In this day and age, Moretz’s graciousness is somewhat of a rarity. The fact that she rang in her 21st birthday this year without a string of scandals in her wake—a fate that often befalls those who enter the Hollywood machine at a young age—seems proof that she isn’t your average child star turned actress. Instead, Moretz has taken the common experiences of adolescence—from romantic relationships to navigating social media—all in stride, and emerged from them seemingly wiser and more confident in herself. I sat down with Moretz to discuss what it’s really like to go bare, both with your face and your vulnerability. Turns out both can be incredibly liberating. From her battle with cystic acne to her morning meditation practice, keep scrolling to get to know Chloë Grace Moretz. Congratulations on your partnership with SK-II. How did it feel to be photographed with no makeup on for a major campaign? It was really exciting. When they first approached me to be a part of the campaign, it kind of felt like, wow, I can’t believe this hasn’t happened yet. The fact that this Bare Skin Project is something that people haven’t seen before… It’s just exciting. It’s so modern and it’s so progressive and it was a little scary at first to think like, oh, you’re going to be in a global campaign with absolutely no makeup on, but it was enticing to show that transparency to my fan base. What’s the message that you hope to share with your fans with this campaign? Confidence—inner confidence. Waking up in the morning and being comfortable with the girl that you see in the mirror and going from there and knowing that you don’t have to hide behind layers of makeup—that you’re beautiful the way that you are. Which is a simple idea, but we all know that psychologically, it’s a massive thing to overcome, especially in America. I just really want to put this out there in the world for young girls to see that if I’m confident enough to do it in a global campaign, which is going to be blasted everywhere, then you can too. What about someone who might have acne or redness and might be less confident going out without any makeup on? I know personally when I was younger, I used to have really, really horrid skin. I had cystic acne when I was a kid, and it’s an emotional battle. I think the hardest part was knowing that you can’t hide from your face. And it was so hard to walk out in daylight and know that I have all these blemishes, and if anything, it was more psychological for myself than other people. And to overcome that was really difficult, but for me, pulling everything back and stripping everything away. Instead of using 100 products, [I learned to] break down to the basics and start with what does your skin need? and what are the basic things? Are you eating right? Are you drinking enough water?’ And don’t put every product under the sun on your skin. Try and keep it simple, and listen to your skin. Because it will tell you what it needs. What’s your diet advice for anyone dealing with cystic acne? Water. Water, water, water. I mean, we don’t have enough water in our day, for sure. Especially if you’re working and stuff, you drink a lot of caffeine. It really tears your skin up. And then you know, we all love dairy and stuff like that, but if you’re having trouble skin, it’s a hard thing to get away from. Definitely try to get away from it. What’s your current skincare mentality? Simplicity. 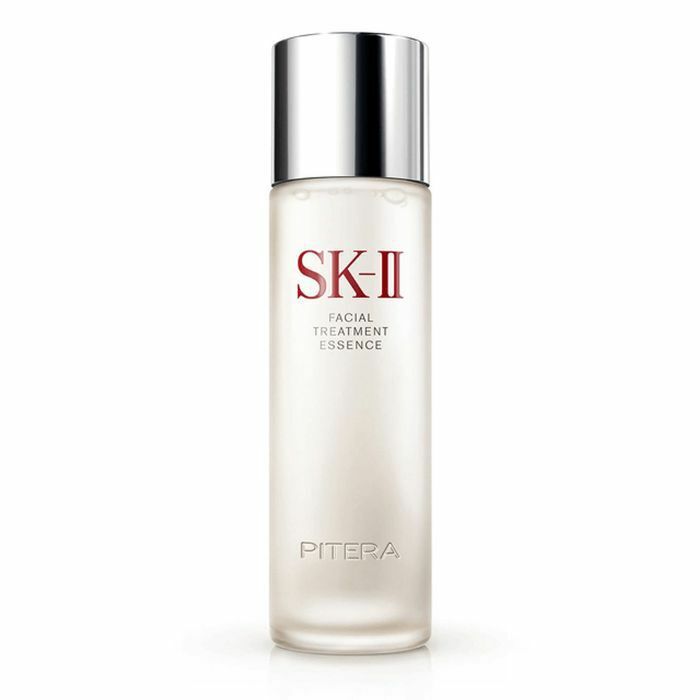 The only thing I integrate into my skincare routine is SK-II Facial Treatment Essence ($179). I’ve given it to my four brothers, and none of them have ever used facial products because they’re always terrified. They think it’ll make their face break out, but they actually started using the SK-II Facial Treatment Essence and my brother Trevor was like, “I swear to God my skin’s never been so radiant.” It just takes what your skin should be and it boosts it and it makes it the optimal level of radiant and glowing and naturally moisturized without having to add all the stuff to it. Otherwise, I wash my face with olive oil and honey, and that’s it. I try to keep it as organic as possible. When I can’t pronounce the names that are in the products I use, I don’t really put them on my face. You turned 21 this year. What do you feel like is the biggest difference between your 20s so far and your teens? I think for me, I started to care a lot less about what people thought. That was a big thing for me. I saw a massive difference from 18 to 21 because I just stopped. I also stopped caring about what other people did. I was just kind of like, it’s not my business; I’m not their business. You just live your life in the way that you think is right for yourself and trust yourself and don’t get caught up in the big trends of what you should be doing or should be saying. Find your own ideals and stick to that. You grew up in the age of Instagram and social media, which can be a double-edged sword. What are your thoughts about social media as a whole and how do you approach it? It’s kind of a mixture of a lot of different things. When I was younger, I really wanted to get across who I thought Chloë Grace Moretz was for other people—the girl they wanted to see, the girl they wanted to hear from. And then as I grew up, I was like, it’s harder to keep up all the mantels of what you think you should be. And I broke that down a lot. And I kind of pulled it back to the simplicity of like, who am I? What do I stand for? Who do I want people to perceive me as? Do I really want to be putting on a mask when I step into the spotlight, and what does that even mean? When I broke that down, I kind of brought this transparency between me and my fan base. I give that to a lot of the younger people who are younger than me—the 14- and 15-year-olds out there, their amount of transparency is really, really cool. You look at actresses like Rowan Blanchard or, you know, these really young girls, and they’re badasses in a lot of ways. And I kind of took a cue from that shift in the zeitgeist, of being transparent and showing people who you are and what you are is enough. And that’s something that I didn’t grow up with, but I grew into. Have you found that showing vulnerability has had a positive effect on your life? Yeah, being honest about daily struggles and being honest about what you go through… I know at least I grew up under like this guise of like, these people are kind of untouched and kind of on this mantel, but then when you break that away you start to realize that we all kind of have the same struggles. We’re all human and I have struggled with self-confidence in the same way that an average 21-year-old girl in college would struggle with self-confidence, and when you kind of break it down to that level, you can speak on an intimate plane with other girls. And I think that communication and that dialogue is so important to the future of femininity, and to womanhood. You’ve more or less grown up in the public eye. I can’t imagine it’s been easy. Are there any wellness practices you do to help you stay grounded and feel good about yourself? Definitely. Integrating yoga and meditation into my life, and finding my own kind of spiritual practice was really important for me. Learning to live in your own silence for a little bit… That’s what meditation really helped me with. I started to force myself to integrate yoga into my morning ritual. So sure, you turn your alarm off, but before you look at your phone, you get out of bed and you do a little yoga routine and just that moment for yourself will connect so much spiritually and will really ground you and really help you start your day off on the right side, instead of being rushed and frazzled and over-inundated from the moment you open your eyes. Hollywood obviously has this reputation for being very superficial and surface-level. Having grown up in that “scene,” how do you stay authentic and true to yourself? [Laughs] You know, for me, I feel like I’ve always been authentic behind closed doors. With my family, I’ve always been really upfront with who I am and that kind of transitioned into being very politically upfront as a young woman. Partnering with SK-II for their Bare Skin Project, I don’t think I even realized how much confidence it would give me, but it’s a level of respect to yourself and the body that you were born in that I think has really helped me. And I think it’s a large part of the next step in my career and my next step in womanhood—in young womanhood—is being as real and transparent and honest to myself and to those around me as I can. Last question. What do you hope to accomplish in your 20s? A lot of things. I’m actually starting to direct—it’s a big next step in my career, so that’s lined up right now to direct a short film with my brother. We’re actually co-directing something together that we wrote together. It’s just an exciting next step, and we’re producing right now—we have about four projects in the works that my mother, my brother, and I are producing together that we sold. So I think just broadening my perspective and opening my eyes to different facets of the industry and educating myself on a daily basis of what is important to me. Keeping myself guessing. Being stagnant is the death of any art, you know what I mean? Watch Moretz's campaign video for the #BareSkinProject and shop her favorite SK-II product below! Click here to see the $9 product she uses to get rid of under-eye bags.